Get all your project activities embedded in one place and view how engaged you're using our Calendar module. Projects calendar is an easy way to securely and quickly organize meetings, events, schedule appointments, manage deadlines and more - all within a browser from your desktop. A project calendar will help the team to stay on top of the schedule, manage project activities all at one place and make the work productive. It also helps the team in easily identifying the dates in which they are engaged so that they can plan ahead and complete the targets on time. Manage your project deadlines and key deliverables with your calendar modules. You can create tasks, bugs, milestones, and events right within the calendar. This gets your work done on a single page and saves time. At the same time, you can view all the project activities scheduled for particular dates in your calendar. Schedule an event within your calendar. To do this follow the steps given below. Select the required project in Projects and click the Calendar tab. Click on a date and enter the name of your event in Title. Select Multi-day event if the event is scheduled to run for more than a day. Select the start and end (for Multi-day events) dates. Select the Attendees from the list of users in your project. Schedule a reminder frequency and enter a location. Enter your comments if any. Click Save to schedule the event in your project. Select the required project in Projects and click Calendar. Click on a particular date in the calendar to add your project activities. Enter the name of the task, milestone or bug in the Enter Title field. Choose whether it is a task, milestone or bug and enable the radio button accordingly. Select the users from the list of users in your project. Select the user from the available list of users in the drop down. Select the drop down to choose the user. Click Save to add the milestone. Select the user whom you'd like the assign the bug. Fill in other details of the bugs in the respective fields. Click Save to add the bug. You can filter calendar views based on Tasks, Milestones, Bugs or Events for any time period. In addition, you can also delete the created project events. To view all the project activities like the task, milestone, bugs, and events in your project. Just select the project and click Calendar. Select in the upper right corner and select the required field from Type and click Find to filter. To view all the project activities assigned to you, then you can view it in the Home. Click Home and scroll down to My Calendar section. Select View More to access the calendar. Click and select the data to filter your details. Choose the Project, select the Typeand Assignee. Click Find to fetch the filter details. If you drag the calendar bar to set a new Start Date, the bar resizes its width for the task duration based on Business Hour settings. For example, if a task with a duration of 2 days starting on September 20 (Friday), 2013 and ending on September 23 (Monday), 2013, is dragged to start on September 24 (Tuesday), the calendar bar is resized from September 24th to 25th. And all weekends and holidays are displayed with a gray background. You can edit or delete the created project events if required. The Calendar, by default, displays the current month with its scheduled Tasks, Bugs, Events and so on. Select the required project and click Calendar. Select Events, click the selected event and click or to edit or delete the event. Click Attachments to associate documents to the event. You can also share comments about the event. Select the email address mentioned in the 'To add comment(s) to this Event mail to' if you want to add comments or share documents to a particular event from your personal account. Learn More about adding comments and attaching files to an event. You can also edit and delete events across projects. Select View More to access thecalendar. Select in the upper right corner and filter events based on Participants and Project. You can choose to edit, delete or associate documents. Likewise, you can also filter and view Upcoming Events or Elapsed Events, based on your requirement. In the calendar module, you can drag and drop the work items across the date, month and year. Hover over the work item name and click the trash icon to delete the work item. Click the particular task, bug or milestone and edit the changes in the respective details page. Also, you can click the event and select Edit to update the new changes and add comments right within the calendar module. Scheduling an event with your team will help you track the status of the project. Say for instance, if you are approaching a milestone and you would like to know the status of the milestone, how many tasks are completed, how many are in overdue etc. then you need to meet up with your team to know the status. 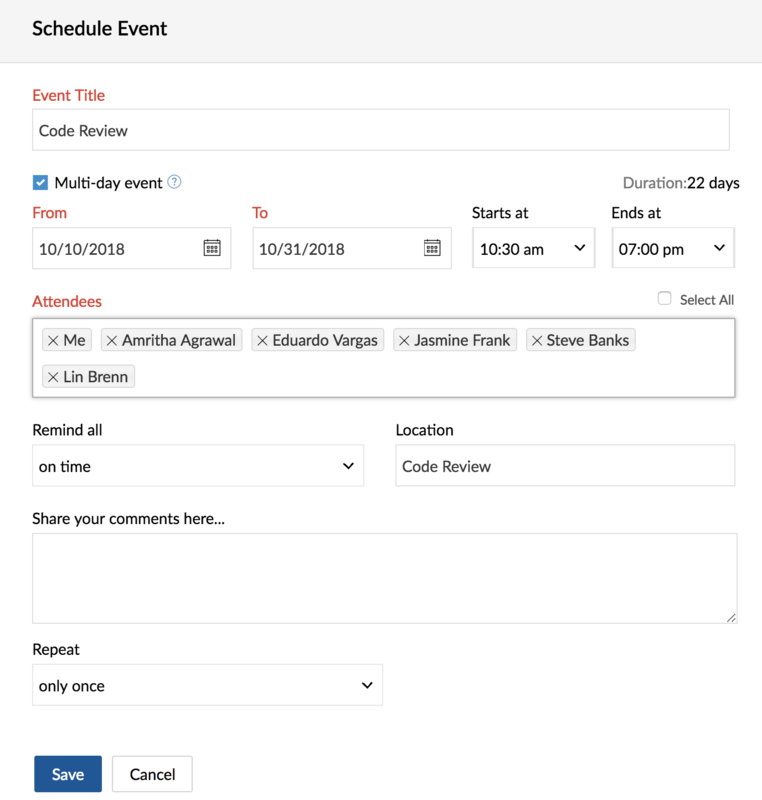 If you're flexible working in the calendar view, then schedule an event right within the calendar. Click Calendar, and then click Events. Click ScheduleEvent in the upper-right corner. Your event just got scheduled. You can edit or delete the events if required. The Calendar, by default, displays the current month with its scheduled Tasks, Bugs, Events, and so on. If you are looking to edit or delete the event. Just click the event and select or found right next to the event name. Did you miss any important event? No Regrets. 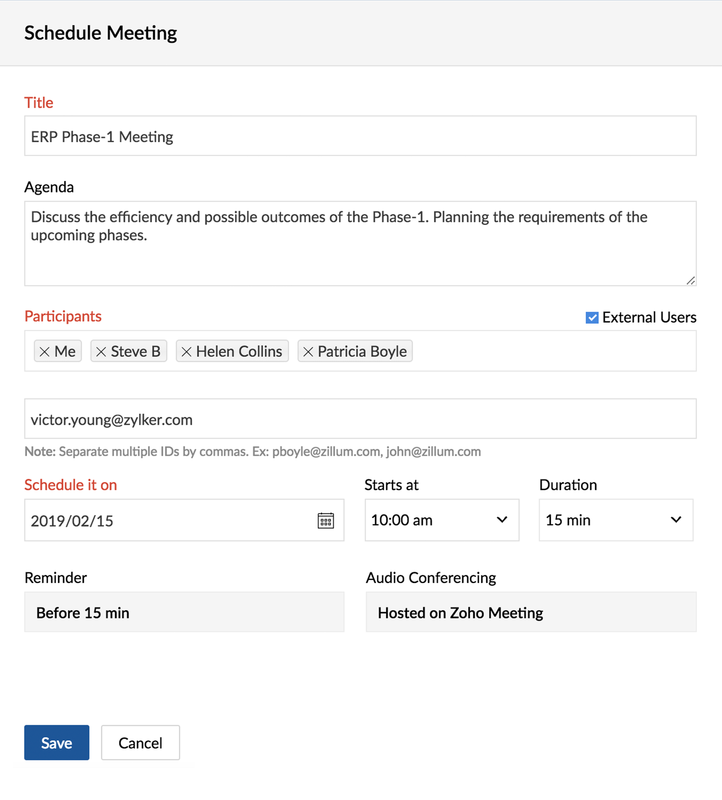 We've provided an option to see Elapsed events where you can check the logged details of the events like presentations, gathered notes, blog references, etc during the course of a meeting. Click Home and scroll down to view My Events section. Click View More in the upper-right corner. Filter your needs based on Project, Participants, and Type. In type, you can view the upcoming and elapsed events. Click Find to fetch the filter details of your event. You can also schedule meetings from the calendar. To schedule meetings, you need to upgrade your Zoho Meeting subscription and activate the integration in Zoho Projects. Know more about Zoho Meeting Integration. Click Calendar, and then click Meetings. Click Schedule Meeting in the upper-right corner. Enter the necessary details and add participants. You can view the calendar events based on a project user or project activity such as milestones, tasks, etc in Zoho Projects. In addition, you can sync your Zoho Projects calendar with MS Outlook using the gcalendar / icalendar link available in Calendar. Select the required project and click the Calendar tab. 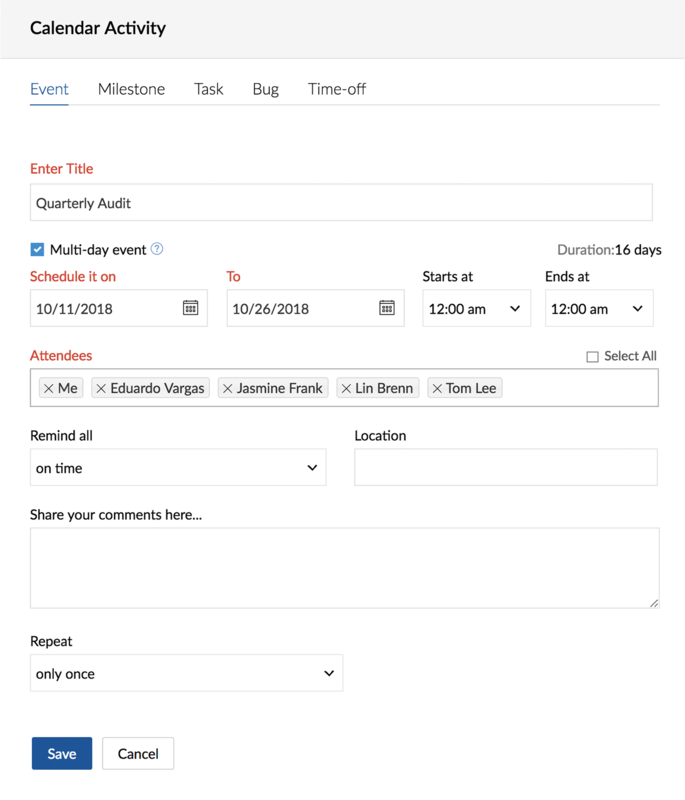 Choose the required Assignee to filter the bugs, milestones, events, and tasks assigned to the filtered team member(s) for the selected month and choose Type to filter only the milestones, events, and tasks assigned for the selected month. The recurring tasks are displayed virtually based on their recurring frequency. In the Calendar, you can open and edit only the active recurring task; the virtual recurring tasks cannot be edited. Neither can you perform any action on those virtual tasks, they just serve as a reminder for your convenience about the project schedule. The recurring tasks are displayed with the recurring icon - . You can also view the resource time-offs from your calendar by integrating with Zoho People. Log into your portal and select the required project. Click Calendar and select in the upper-right corner, and then click the ICS help link. Click the Account Settings drop-down arrow, and then click AccountSettings. Click the InternetCalendars tab, and click New. Paste the gcalendar link, copied from Zoho Projects, and click the Add button. Log into your portal and select the required project, click Calendar. Click in the upper-right corner, and then click the ICS help link. Click the Subscribe option in the Calendar menu. Paste the iCalendar link, and click Subscribe. Provide the Calendar name, and select the things to be displayed in the calendar. Select the Auto-refresh option, and click OK.
You will receive the activities feed in iCalendar application. Log into your portal and scroll down to view the My Events section. Click View More and select Calendar. Click in the upper right corner, and then click the ICS help link. Go to the Google Calendar service and click the Other calendars drop-down arrow. Click the Add by URL option, paste the copied gcalendar link, and then click Add Calendar. All you calendar events are listed in your Google calendar. The tasks, milestones, and events assigned to you will be displayed on Zoho Calendar after the default sync interval. Log in to your Zoho Projects account. Click the Settings link at the top. Click Zoho Apps displayed from the left, and then choose Zoho Projects from the displayed options. Choose the required portal and click Subscribe to update the events in Zoho Calendar.